Anyone trying to lose weight knows it's all about burning off the unhealthy excess fat. But as it turns out, not all fat is created equal—and not all people who need to lose fat even know about it. When your body composition is tested using a DXA scan, you’re not only guaranteed one of the most accurate measures of body fat available, you gain valuable information that can be applied to improving your overall health and optimizing training and nutrition plans. This has been established by researchers, medicine, and sports performance labs around the world. But its accuracy is not the main reason for DXA’s adoption by professionals as the gold standard. Discovering exactly how much of your body mass is made up of fat—and where that fat is stored on your body—is one of the main reasons. It’s the complete picture of your body composition distribution (including lean mass, fat mass, and bone mass) that gets the medicine and research geeks so jazzed. This information empowers you to take the necessary steps to avoid many of the diseases plaguing so many of us today. 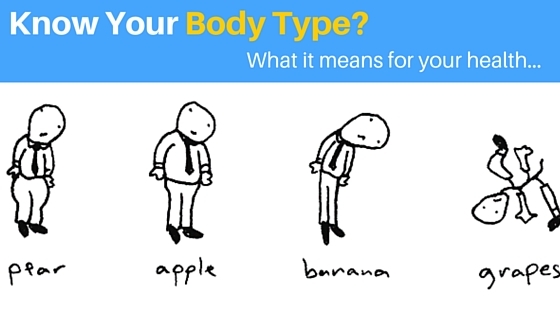 Android fat, the leading cause of ‘apple bellies’ and popped pant buttons, is the fat stored in the midsection of the body: predominantly in the abdomen, but also the fat stored in the chest and upper arms. This is a common fat-storage location among men and is associated with an “apple shape.” It’s consistently associated with increased risk of heart disease and diabetes, hormonal imbalances, some cancers, sleep apnea, and more. Because of the nature of the fat in this region of your body. It’s your visceral fat. 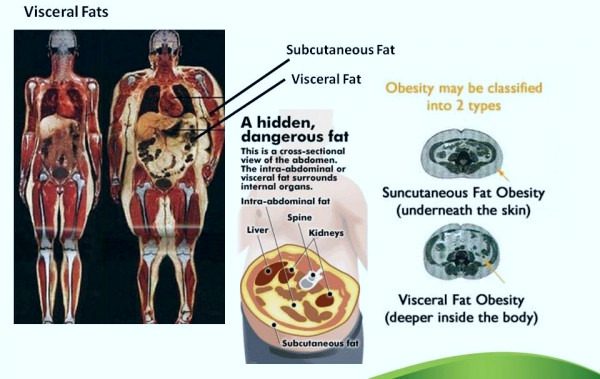 Subcutaneous fat: The noticeable layer of fat just below our skin. The kind that jiggles, dimples, causes cellulite, and preferred fat of mosquitoes, no-seeums, and horse flies. Visceral fat: Found deeper inside our abs, under our six packs and around our organs like the liver, pancreas, and intestines, our visceral fat is linked to all those diseases listed above. The danger of visceral fat is related to the release of proteins and hormones that trigger inflammation in our bodies, which in turn damages arteries, invades our organs, and affects all the vital processes they carry out every minute of the day. So yes. This is a region we want to track regularly and make sure we’re giving it some love and keeping it happy. Since a DXA scan directly measures the different types of fat stored in every region of your body, we will know how to take action that limits and loses your fat, and reduces your risk for disease. Determining the ratio of android to gynoid fat (the A/G ratio)—and monitoring that ratio (you want it below 1.0 btw)—is critical because it’s directly correlated to the prevalence of visceral fat. And remember, this fat storage is a result of organs insulating themselves from toxins by encapsulating the toxins in fat. Ironically, it’s a survival strategy that may impede organ function and ultimately increase your risk for disease. Ideally your android fat will always be lower than your gynoid fat. If you don’t have access to DXA or a nearby DexaFit, a common way to measure the A/G ratio is using the waist-to-hip ratio where the waist measurement is divided by the hip measurement. However, this method won’t tell the whole story, since it’s limited to ‘topical’ measurements only and can’t take a look ‘under the hood’ so to speak. Men, specifically, may be carrying more than the ‘usual’ amount of fat on the hips, thus making them appear OK using the waist-hip ratio; yet they may be carrying more than a healthy amount of fat on the abdomen. A DXA scan eliminates this chance for error by directly measuring your android and gynoid fat percentages and displaying the A/G ratio on your report. This way, it’s easy for you and your doctor to evaluate your risk for health problems associated with a high A/G ratio. What’s even more powerful now is the direct measurement of your visceral fat, using the VAT software available at all DexaFit locations. Not only do you get the Android and Gynoid measurements, you have a straightforward number and overview of how much fat you store in this vital chamber of health in your body! The factors that influence fat distribution are partially controllable by you, and even the genetic factors can be mitigated to some extent. It’s important to remember that fat distribution is influenced by hormones; genetics; race; presence of toxins; physical activity (type and amount); malnutrition; and stress. Of these, you have complete control over the last four—toxins, physical activity, nutrition and stress management. If you possess the relevant information; if you know where you want to go; and if you command the knowledge of the means to get there; the problem which remains is one of execution. But knowledge in the realm of fitness, nutrition, and health never exists in concentrated or integrated forms but as dispersed bits of incomplete and frequently subjective knowledge (a.k.a., educated guessing). The problem of body transformations in particular is not merely deciding what to eat and how to workout; it’s a problem of how to secure the best use of information that provides a framework of knowledge you can use to provide honest and outcome-based feedback while following a plan. A DexaFit DXA scan empowers you with accurate and outcome-based feedback. It helps you discover where you store fat, so you can use the information along with other markers to tailor a training and nutrition program that’s appropriate for your body type, physiology, and goals. If you want more help or support along your fitness path, we’re always here with a map, compass, and supplies to help you get to your destination sooner. >>> Amy is one of our most exciting transformations of late.